Just wanted something classic this time. No rails or stocks or grips or optics or whatever to mess around with. Plain and simple. Great purchase. Great response time. Would buy again from Grabagun. Fast delivery. Shot a few rounds to test it out. Great gun for a great price. If you think you need one, you do. Get this one. No optics, no jams, no problems. Have over 1000 rounds through mine and functions beautifully. Recommend purchase. What I expected of the rifle, extremely reliable and accurate. A couple hundred rounds later without a hiccup, love this gun. Close to those guns we checked out of the armory way back when, but I get to keep this one! Fantastic rifle. Shoots well easy to clean. Third purchase from these folks,need I say more? Aside from a little stock rattle, rifle came flawless,and fast. 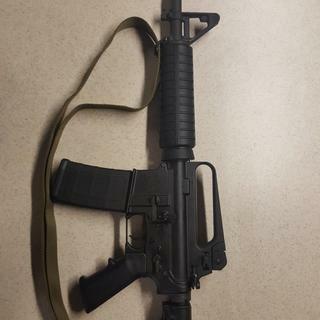 I really like the look of the classic A2 style M4 and this rifle nails it. The upper and lower fit tightly together and I love the look and feel of the thinner hand guards. This is the way carbine AR15 rifles were meant to look. It has M4 feed ramps. This rifle would be perfect if it came with a mil-spec buffer tube, full-auto BCG and an H marked buffer. Maybe I'm spoiled on ARs, I've got some nice ones including Sigs, custom Lancers and Colts. That said I shot a Bushmaster M4A3 a few years back and I remembered it being a much finer weapon than this. Finish on the upper and lower was completely different colors of black, stock rattles like Nancey Pelosi's shriveled up brain inside of her over inflated skull, and the lower/upper fit is pretty poor. Commercial spec tube on this, it has a slant. At least the guns reliable, and I got it on a great sale. At 950$ this would be the worst buy in ARs, it's marginally acceptable at 559$. Oh well, next time I'll buy a Windham. Great service, great product, unbeatable price with rebate. Fit and finish first rate on my rifle despite the unfortunate experience of a few reviewers (suggest they request a replacement item). Only negative of my rifle is the trigger pull is on the heavy side, but I know of some ready remedies. Great accuracy out of the box, feels like my Vietnam era issue. Completely satisfied with my purchase. Great price and great service. Fit and finish are great. Shipping was very fast. Price was fantastic. I am fighting the urge to buy at least one more! I bought this directly from Grab-a-Gun at the Coppell location. It was very busy but they were exrtreme helpful and friendly. This was an amazing deal. 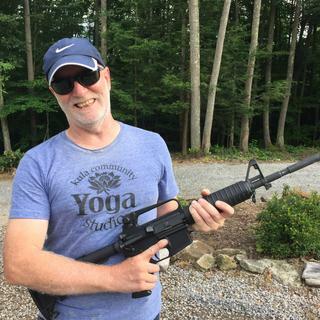 Some people don't like the fixed carry handle but I already have a flat top Stag and love the old school handle on the Bushmaster. I mounted a see thru rail on the handle and put a low rise Strikefire II on it on I have to say as much as I love my scoped Stag I actually like this one better. Close Quarters I am grabbing this one. Grabagun makes firearm purchases a pleasure. Got a great deal on a great gun! Couldn't be happier!! The online purchase of a Bushmaster XM15-E2S 5.56 rifle was nothing less than "OUTSTANDING." Their web site is user friendly and the ordering process went smoothly without any hiccups. Their prices are less than regular gun store sale prices. The above item was ordered on Dec. 10, 2014, received by my FFL dealer on Dec. 15, 2014. Would definitely recommend GRABAGUN for all your gun store needs. Great rifle at a fantastic price from grabagun! I am very pleased with the quality of this weapon and the service I received from grabagun. I am leaving it in "combat" mode. Shoots great with sights that come with it and a hell of a lot of fun! If you buy one of these you might want to be careful....you will want to buy more! What a savings and very fast service . This gun is awesome and has all the features that I wanted in a AR . Bushmaster makes a great rifle . I was thrilled with the price of the weapon, the speed with which it shipped and was delivered. But your customer service contact by phone is horrible. I sat on hold three different times for 20 minutes and never did talk to anyone. I finally sent an email and got an answer within a day. Lowest price I've seen anywhere for a quality weapon. Thank you for keeping the 2nd amendment viable! Just got this gun last week.Though I have not had time to take the gun to the range I am very impressed with GAG's service. Not to mention you can't be the prices. This bushmaster went on sale and I had to have it. Gas-operated, semi-auto. Modeled after M4-type carbines w/additional barrel length for legal sale individual officers. Chrome-lined military-profiled barrel. Birdcage suppressor. Manganese Phosphate outer coating ensures corrosion- & rust-resistance. Thermoset composite telestock, pistol grip & 2-piece handguards. Handguards internally shielded against barrel heat build-up. W/E adjustable dual aperture M16A2 rear sight system, Non-Detachable Carry Handle, A2: 300/800 meter rear sight system (1 MOA elevation & 1/2MOA windage adjustments) - 1-year warranty.